Every time you buy something you get a receipt. After you've recorded it in your tracking book you can usually throw them away unless it is for something with a warranty or that you need for tax purposes or to prove ownership. 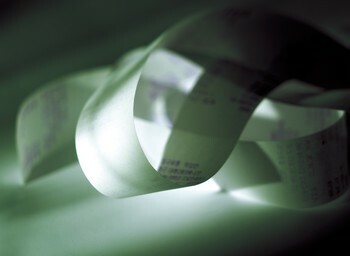 The problem with keeping receipts is that often they are printed on thermal paper, which over time fades or darkens. This is because the chemical used is sensitive to light, heat and moisture, or like me you accidentally throw it away. I had reason to return a sheet set to Target this week and struggled to get a refund because I didn't have the receipt. The store flatly refused to even listen to why I wanted to return the sheets. What to do? Is there something else I could use as proof of purchase? And can a faded receipt still be used as proof of purchase or for tax purposes? Keeping the original receipt, especially in tip-top condition will help. Do this by storing it away from heat and light and do not be tempted to put it into a plastic page protector. Of course even taking these steps the receipt could still fade or go black. The best thing to do is to take a copy of it and staple the original to the copy. If that sounds like too much work and you have a smartphone, then use the ACCC Shopper app to take a photo and store it. According to New South Wales Fair Trading they are all considered proof of transaction. Armed with my statement I returned to the store yesterday and stood my ground. I offered the transaction on my statement as proof of purchase and was told it didn't prove I'd bought the sheets. I then suggested that it was acceptable proof and if I didn't at least get an exchange I'd be sending a complaint off to the ACCC. In the end, after about 45 minutes of haggling and discussing and going back and forth I did get my money back. The sheets were faulty (the top hem on the flat sheet wasn't caught all the way across) so I was entitled to a refund or at the very least an exchange. I opted for the refund as we'd found nicer, cheaper sheets. The point of this epistle is to let you know that you do need your receipt OR one of the acceptable alternatives as proof of purchase, and that there are indeed legally acceptable alternatives. Don't be bullied into backing down if you have an acceptable alternative to the original (although the original is always the best defense). It's unfortunate that honest people have to take these measures but unfortunately working in Retail has shown me that for every person who has honestly misplaced their receipt there are ten who are doing something dodgy, like returning stolen goods or returning to get a higher cash amount back, buying on sale and returning when the item is full price again! It's good to know their are other ways we can help those doing the right thing! love the look of the app, well done on getting a refund!